Need more funding? New Members? Looking to be more inclusive? 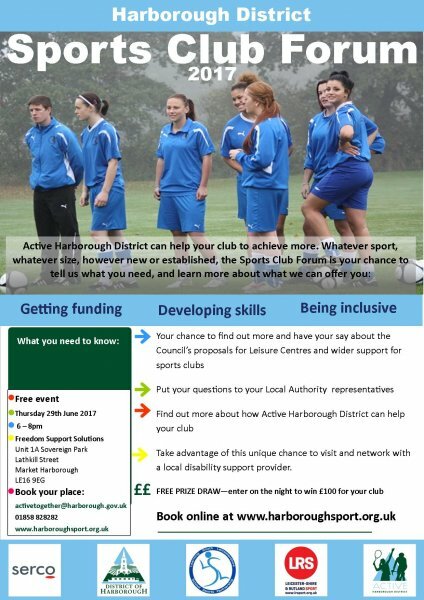 Active Harborough District can help your club to achieve more. Whatever sport, whatever size, however new or established, the Sports Club Forum is your chance to tell us what you need, and learn more about what we can offer you. Hear from Freedom Support solutions about current projects and chances to offer more to local people with disabilities looking to get active. You will also have the chance to have your say on the Council's proposals for Leisure Centres and wider support for sports clubs. Includes a light buffet and a prize draw - 1st prize wins £100 for their club. Use the form below to book your free place.